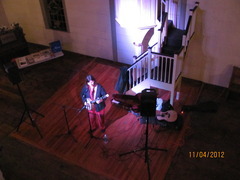 Built in 1806 and recently rehabilitated, the old Elias Church is now the Elias Center for the Performing Arts. It is also an ideal location for a simple yet elegant wedding ceremony. Historic home owned by MHRA and preparing for rehabilitation. Built around 1830. Owned by PMI, the Gutelius House is open at designated hours for tours and special exhibits. 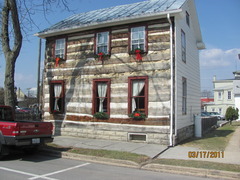 This 17' by 24' interior log house is owned by MHRA. It is called a log house rather than a log cabin because log cabins, usually build in the wilderness, were meant as temporary houses with no foundations and only one large room. Log houses had foundations, multiple rooms and windows and were meant as permanent homes. Parking is available directly across the street. Held the third Friday in July, this free event features blueberry pie, blueberry ice-cream, blueberry sauce, blueberry whoopee pies and bluegrass music. Event runs from 6 pm to 9 pm. Bring a lawn chair. Held every year on the third Saturday of May, this is a ticketed wine tasting event.